Four in five young mums in Singapore are working mothers and employers should strive to be flexible and accommodate them, said Senior Minister of State in the Prime Minister's Office Josephine Teo. She noted that mothers need support all round - from fathers, employers and co-workers - to be able to meet their family and work obligations. 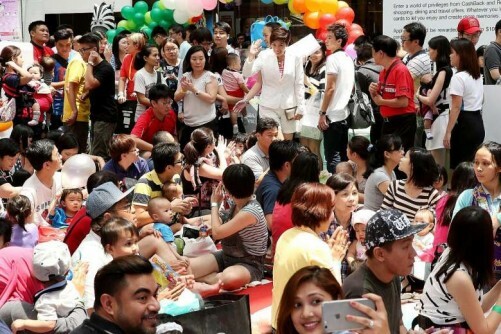 Mrs Teo, who is also in charge of population issues, was speaking at a mass baby-weaning event, where 180 mothers with their babies attempted to enter the Singapore Book Of Records for the largest number of babies being fed soft foods together. The needs of new mothers are constantly changing, she said, and suggested that employers help by putting in place alternative work arrangements. "When a person becomes a parent for the first time, they're learning how to fulfil the role well. "You need to give them time, and to give them time also means that the workplace sometimes needs to make alternative arrangements, to make it possible for them to care for their children," she added. Mrs Teo suggested that employers could assign colleagues to cover each other's duties, to form a "mutually supportive" culture. "This time round when someone has a child, you help her. "Next time round, someone else has a different need, for example looking after their parents... then you have to chip in to help them. "This idea of mutual support is very important," she added. She singled out small and medium-sized enterprises (SMEs) as a category of employers who need to be sold the idea that supporting parents need not be complicated. Many SMEs recognise the importance of offering this support but say they do not know how to get started, she said. They think that supporting parents could be a very complicated affair, and that they may need to invest a lot in resources. But the truth is that it can be as simple as appointing people to cover each other's duties, Mrs Teo said. One of those at the event, Ms Cali Fay, 27, said it is important to set the expectations of bosses right on adjusting after the baby arrives. She recently rejoined the workforce after six years of not working. He second baby is eight months old, and she now works for an events company. "When looking for a job, it is important to talk to the company to see where they stand. "My current company is quite understanding," she said. Yesterday, events were held around the island to honour mothers. They ranged from yoga and zumba activities to children recording videos expressing love for their mothers.